Mail Order Anniversary - Are You Finished Yet? We may live in the age of email, texting, and social media, but there is nary a person who doesn’t get a little thrill when the mail carrier delivers an envelope or package to your door. And since this is one of the busiest times of year for snail mail, Emily and I thought we would write about MAIL for this week’s Remember the Time Blog Hop. Did you have a pen pal growing up? Did you develop a love affair with buying and receiving things from the Home Shopping Network when you got your first credit card? Did the mailman actually turn out to be your real father? Whatever the story, just be sure there’s an element of nostalgia to it. ALSO, Emily and I have a little something special in store for our blog hoppers. We will be taking a break the week of Christmas, but we wanted to have a bit of fun before our brief hiatus. In order to do this, we need a little something from YOU. Get out those old photo albums and send us a copy of a holiday photo from your past: you sitting on Santa’s lap, a photo from a special Hanukkah or Christmas celebration, you opening gifts, etc. 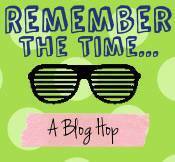 You don’t have to actually be a RTT blog hop participant to take part in our party…anyone can send in a photo! The more the merrier! If you are a blogger, we will make sure to link back to your blog. 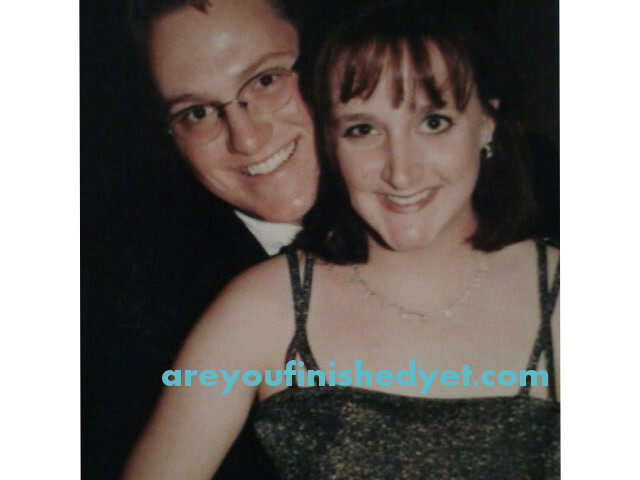 You can send them to me at areyoufinishedyet@hotmail.com or to Emily at thewaitingblog@gmail.com. Or you can post it on our Facebook pages. We would love to have your photos by this Sunday, December 15th. It was a good day by college kid standards: I had just received a package. I immediately recognized the familiar, hieroglyphics-esque, all caps handwriting on the address label, and my heart became giddy. I also noticed the bold message, Do not open until February 21st. My boyfriend Kurt had sent my one year anniversary present almost a month ahead of time. Part of me guessed he just wanted to make sure it got to me by the big day. International mail could be tricky. The other part of me was sure he just wanted to torture me. Ah. Young love. Sometimes drunk love But I think this picture is just young love. 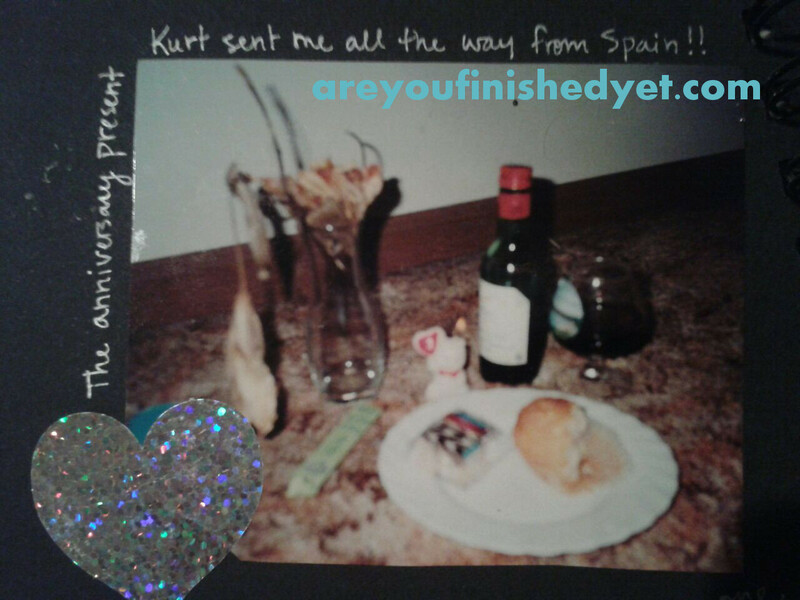 Kurt had been studying abroad in Spain for about a month when the package arrived. And he still had five more months before he came home. To say I wasn’t happy about the situation would be an understatement. In fact, I am embarrassed now to think of how miserable I was to be around. But I was in love for the first time in my life. We were still in that “I want to be around you all the time” phase, yet I wasn’t going to see him for six whole months. We wouldn’t be together for my last semester of college, or our one year anniversary, or our first Valentine’s day together. He wouldn’t be there to watch me graduate. And, in my defense, I was only twenty-one. Twenty-one-year-olds can be awfully dramatic sometimes. But we did everything we could to make an entire ocean seem to be not such a wide expanse between us. International phone cards were expensive, though we would call each other every now and again. Kurt would always cuss out the automated voice that would come on to tell us we had one minute remaining on our talk time. We emailed almost daily and set up times to “talk” in a private chat room we had created. None of this was as easy then as it is today. Kurt had to purchase time at an internet cafe, while I had to keep my emotions in check as I poured my heart out in the middle of my college computer lab. There was also a time difference with which to contend. I remember desperately typing, “Are you there? Where are you?” over and over again when we had some miscommunication over when our next live chat session would be. But getting “real” mail was special. We would make recordings for each other on cassette tapes. Sometimes we would just talk through a rough day we had. Sometimes we would tell each other stories or play a song. It was like a little audio diary to each other. Whenever we filled a tape, we stuck it in the mail. The best part was never knowing when one of these little surprises would show up. And considering how little we were actually able to talk to one another, the sound of Kurt’s voice was a welcome comfort. And then there was “the package.” That package that sat on my bedroom floor for almost the entire month of February, just taunting me. What had he sent me for our anniversary? Was it jewelry? Was is Spanish perfume? Oh, the possibilities. My boyfriend had mailed me our candlelit anniversary dinner together. He had thought of everything: a plate, utensils, some little cakes and muffins, a souvenir glass, a small bottle of Spanish wine, a little bear candle with a #1 on it, and even a vase with a very pathetic looking Stargazer Lily (he had tried to keep it alive, wrapping it in a drenched paper towel and some foil). We had our special evening together, over the phone, by candlelight. And it of course ended with Kurt calling the automated warning voice a stupid b*tch when only one minute remained of our date. I’m not sure how much more romance I could have asked for. It’s no wonder I ended up marrying him. I have to know – what kind of cakes and muffins survived a month plus in a box? I do think we still have the tapes somewhere. I don’t think I’ve listened to them since then. I’m actually a little scared to know what’s on them…. I’m pretty sure I was super disgusting. And she was a stupid B for the record. That’s a whole other blog post!! 🙂 Yeah, he’s a keeper. This reminds me of when I was studying abroad. You’re right-getting mail as a college student is great. Getting it while out of the country is even better. The highlight was getting a box I shipped to myself full of stuff I didn’t want to cram in my suitcase. It took quite a while to arrive, so I had forgotten what I had included. That was a brilliant idea!!! Creative packing indeed…with the bonus of getting fun mail! Remember that Twinkies have a half life of 500,000 years – this can come in handy one day if you want to relive this special moment! I agree with you on this Kelly – I love getting “real” mail and I love sending it, whether it be a package or a postcard. There’s just something more special about the thrill of going to your door or mailbox and finding something unexpected as there is no “beep” or “theme song from the Men in Black movie” alerting you that you have a message. Nice memory, thanks for sharing. Aw, this is such a sweet story. He has always been good at this kind of thing. I think we do have them…but I think it might be weird to listen to them now. And yeah, I know I was probably pretty annoying. Sorry about that. Awww! This is such a sweeeet story, Kelly! This is a guy worth keeping; good call. I love that he actually tried to send a flower too. Sweetness! He is a keeper. I got very lucky. I know, He was so adorable in his hopeless attempts. The dude has the romance thing down. Style sense, not so much. But romance, yes. Now that is truly romantic! You are a better woman than I because I probably would have opened that package for a sneak peak. Isn’t that terrible? What a great way to show you how much he cared. That was smart to take a picture to remember the moment. I can be overly sentimental like that. I could probably be accused of not enjoying moments enough because I’m so worried about getting the pictures to remember them by. It really was. And looking back, it’s pretty amazing that a college kid came up with something like that!